Leoben, 05 April 2019 – To improve the efficiency in modern cars on the way to electromobility and in challenging industrial power conversion applications the power density has to be increased without limitations on performance and reliability. Based on the AT&S ECP® (Embedded Components Packaging) technology active and passive components have been integrated into PCBs for low-power designs and are used in volume production meeting high-quality requirements. Against this background the implementation of power semiconductors like MOSFETs or diodes directly into the PCB is a very promising approach to fulfill the increasing needs of electromobility and industrial applications. AT&S successfully used the expertise with its ECP technology for the implementation of efficient power packages and modules. Compared to SMT-based technology a space reduction for the power module of 50% could be realized. In addition, very good results in terms of switching behavior, heat removal and power cycling robustness were achieved. The EUREKA CATRENE “EmPower” project with the goal to develop a technology for embedded power components for electrical vehicle applications was running from May 2013 to February 2017. The project coordinated by AT&S included ST Microelectronics, Atotech, ILFA, Continental, TU Wien and TU Berlin as further members. Interconnections between the power devices and wire bonds on Direct Copper Bonded (DCB) substrates are a primary source of parasitic inductances in today’s power packages, leading to significant switching losses, limited lifetime and reliability issues due to the high-power loss density. In contrast, the EmPower embedding concept contains copper interconnections with large cross sections between the power devices and the chip pads by short copper-filled via and large copper cross section. This technology allows to place the necessary copper connections and pads on both sides of the package in an arbitrary manner, thus satisfying the needs for both, high electrical and high thermal conductivities. On the other hand, the concept sees the power semiconductors being coated on both sides with copper and embedded in a printed circuit board construction using a galvanic interconnection process. Lastly, making the shortest possible electrical connections between the power semiconductors is minimizing the parasitic inductances and significantly improving the switching performance. At the heart of the EmPower implementation are so-called power cores as function blocks for power modules. The innovation in terms of the new power concept entails the embedding of power devices such as MOSFETs and diodes as chips with significantly reduced thicknesses in comparison to SMT devices. Cost-effective and effective thermal management is realized by embedding the power semiconductors in a module enabling double sided cooling. 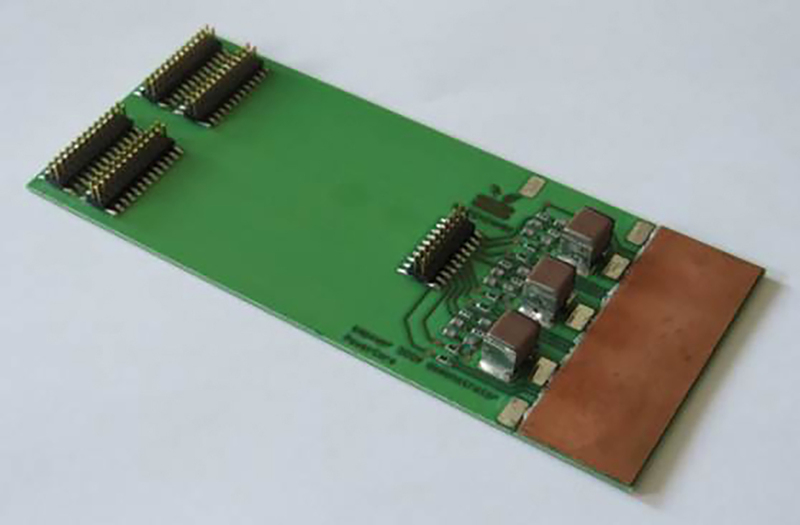 This technology allows power semiconductors to be embedded in such a way that the rear of the power module provides a complete copper surface for the connection and allows chips of up to 10 mm x 10 mm to be embedded. The contacting of the pads on the upper side of the components is done by means of micro-via and full area interconnection on the lower side of the devices.